Ireland's lost generation: What happened without the 20-somethings? Part two. 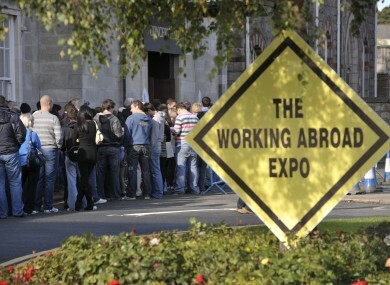 With emigration taking its toll, we look at the Ireland that is being left behind. In part two, education and sport. In part two of three, we look at the effects on sport and education. Sport, culturally, is the lifeblood of many Irish communities, bonding towns and villages. That ethos is being stripped away in many places as players in all sports head for pastures new. In December, a survey by the Tipperary county board found that the county has lost 639 players in the last five years. County secretary Tim Flynn said at the time that the survey showed the effects of the recession. ““I still believe that the results are a reasonable reflection of the trend over the past five years since the current recession took hold. Elsewhere, the buzzword is amalgamation as storied clubs aim to stave off extinction by combining their forces. And it is not just in rural settings. One Dublin club member says his club have lost “at least 20, probably 30″ players in the last three years. Last year, Mayo’s Kilmovee club made headlines by posting an image of an “Emigrants XV” of players who had left their club. And it’s not just native games. The pinch is being felt across the board. Stephen Findlater of TheHook hockey website says that field hockey is another sport impacted by emigration. “If you take my own club (Three Rock Rovers), we won the All-Ireland in 2008, but since then we’ve lost 16 players from our first and second teams. One area where the trend is different, however, is third-level education. Rather than seeing a decline in mature students, many colleges are seeing an increase in 20-somethings going to college. However, those seeking training are doing so firmly with job prospects in mind. “What we’re seeing,” says Steven Roberts of Griffith College Dublin “Is an increased interest in the kind of areas that there are jobs in. Neither has the flight of 20-somethings affected the numbers enrolling in primary schools, with over 71,000 pupils starting junior infants last September. That trend will continue, the Department of Education believes until 2019, suggesting that the effects of the loss of many of this generation will be long-term. One veteran Meath teacher says that the only thing that has changed is the gender balance at the school gates. “The ages would be more mixed, because some people have kids later and you’d see more dads now, but really, it seems that if people have young kids, they’re toughing it out here. Next week, we look at Irish society and coming home. Email “Ireland's lost generation: What happened without the 20-somethings? Part two. ”. Feedback on “Ireland's lost generation: What happened without the 20-somethings? Part two. ”.